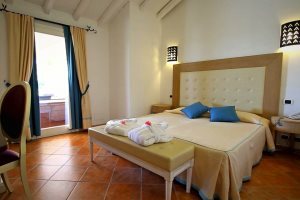 Hotels Villas Resort is a great family friendly hotel close to the stunning beach of Costa Rei. This beautiful hotel, recently built in a typically Mediterranean style in local stone, is decorated in white and neutral tones and the occasional splash of colour with great attention paid to every detail. Set in a lovely garden landscape, it blends well with the surrounding countryside and is close to the fine white sandy beach by Scoglio di Peppino. The hotel’s private beach is 500 metres away, lapped by crystal clear water with a gently sloping seabed making it ideal for children, and the beach bar serves drinks and snacks throughout the day. It can be reached in less than 10 minutes by a footpath. Alternatively a golf buggy shuttle service is available. Many more stunning sandy beaches are within easy reach by car. The hotel’s restaurant ‘Villas’ serves breakfast, light lunches and an international buffet in the evening while the American bar is on hand with drinks, snacks and ice creams throughout the day and evening. A children’s club runs from mid-June to early September and there are plenty of activities for adults and older children including tennis and volley ball plus a fully equipped gym and a number of classes including Latin dance and water aerobics. There is a good range of water sports, as well as horse riding and diving nearby, plus a spa and beauty parlour in the hotel itself (all payable locally). Swimming pool, restaurant, American bar, beach bar, Wi-Fi, sunbeds and umbrellas, occasional evening entertainment, piano bar, live music. Payable locally: Compulsory club card €7 per adult per day, children's mini club (from 11/06 to 10/09, €5 per day), Infant charge €20 per day, tennis, mini golf (600m from the hotel), horse riding (2km from the hotel). En-suite facilities, satellite television, telephone, hairdryer, safe, minibar, air-conditioning. 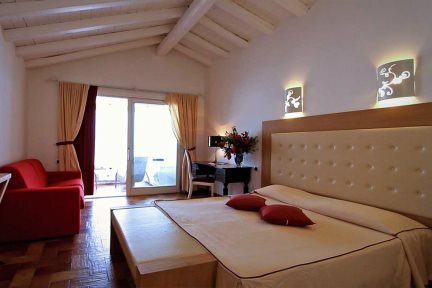 Elegantly furnished double rooms, some of them with the possibility of adding a 3rd and 4th bed for children, furnished patio or balcony with private bathroom and shower. Very spacious apartment located in an exclusive and reserved area, on the ground floor or on the 1st floor, with a double room, a twin or single room and a separated living room, one or two private bathrooms with shower, furnished patio or balcony with Jacuzzi with supplement, Satellite Color TV, direct telephone, air conditioning, Mini-bar, hairdryer, in-room safe, prestige courtesy kit, beach service with No. 1 Sun umbrella and No. 2 sun beds from the 3rd row.